Check out the August Carnival of Children's Literature here at Po Moyemu--In My Opinion. You won't be disappointed. P.S.- The next issue is listed as located at Charlotte's Library. I take it back, I take it all back ten times over... Christopher Paul Curtis has redeemed himself in my eyes with Elijah of Buxton. Early this summer I gave a less than stealer review of Curtis's Mr. Chickee's Messy Mission. (I'm sorry, I just really didn't get into it.) And I love Christopher Paul Curtis so much, it really pained me to do so. I truly believe Christopher Paul Curtis is the best story teller of our time. Or should I say my time. (Not reveling what that is, however) This story can be used to prove my point. If it isn't nominated at the very least for many awards, I would be shocked. I am positive it will gain Curtis his 3rd (?) Corretta Scott King Award. But will it be in the running for that all coveted Newbery? I say, "yes!" This story is packed full of funny, serious, and educational information. I had never even heard of the Canadian town of Buxton. Buxton is the setting of the novel and has a wonderful history I am only now learning more about. You can find information on the link I have provided which will take you to the Buxton National Historical Site & Museum. I don't exactly know if I want to try to explain the plot of the book. I think it would be best read yourself. There are great reviews out there. Including this one from Fuse #8 and Part Two also by Fuse #8. So, I am not going to try to do this book justice. I just want everyone everywhere to read this book. Read it to a kid, read it as an adult, read it to be a better person. There are two books I read to my students to get them thinking about reading. 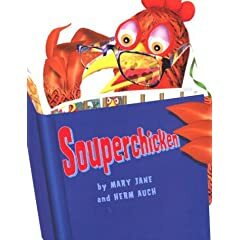 Souperchicken by Mary Jane and Herm Auch and Miss Malarkey Leaves No Reader Behind by Judy Finchler and Kevin O'Malley. This year was no exception and I always get a good feeling after reading the books. I read Souperchicken to emphasis the point that reading is important to your life. Basically the message or moral to the story is Reading can save you life! I don't think kids realize or think about this point. If you couldn't read, there are lots of things in life that would be more difficult. I promise I am still working on reading Elijah of Buxton by Christopher Paul Curtis... But until then, something fun. I got the idea from Jen Barney at A Teacher's Life. The students know they won’t get away with misbehaving, but at the end of the day they appreciate you and all they have learned. You are conscientious, and your classroom is neat and organized. When someone is in a bind, they know you will be sincere in your advice and council. The students learn from both your class and your example. You are quick to compliment and praise. You always look for the good in people and events. I thought that was so creative! I bet there are a lot of cool ideas for book talks, but this one seemed the most realistic and most "book talk-like" that I have read. Today I hit a bookstore jackpot! I was not necessarily looking for anything in particular and I found two brand new books from my favorite authors! I will get reading right away, but I am not sure how fast I can finish them. P.S. 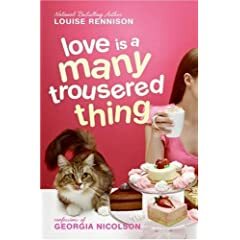 I am aware that the series of Confessions of Georgia Nicolson by Louise Rennison is not 5th grade appropriate. I read them for myself. Do not be fooled. They are cute and hilarious books, but not made for younger readers. 7th grade and up I would say. Please, Please forgive me for my lack of blogging. I am scurrying around trying to get ready for my little 5th grade cherubs and the 2007-08 school year. I cannot even believe this is my 10th year of teaching!!! I will continue my blog of course. I have just been so busy. In the meantime, check-out any one of the blogs in my section titled Some Noteworthy Blogs. There are some great conversations going on out there about books, reading, writing, teaching, and life! My advice and rules for newbie read-alouders 1. You HAVE to like the book you are going to read. 2. Read the book before hand 3. Try to have the kids "below" you. If you are sitting in a chair, get them on the floor. If they are in chairs, stand. Maybe this is just me but I like to be at a "commanding" elevation if possible. 4. Know what kind of time frame you are expected to fill. 5. Make eye contact with your listeners while you are reading. 6. Have fun! If you are not enjoying yourself, no one else will. Do you have other advise or rules? Any books you would recommend? Feel free to comment! What is your blog worth? I got this from A Chair, A Fireplace, & A Tea Cozy. Very interesting, and kind of weird. I don't have any idea where they come up with the calculation, but interesting none the less. Notice how much less my blog is worth compared to A Chair, A Fireplace, & A Tea Cozy. I best be stepping up my game! 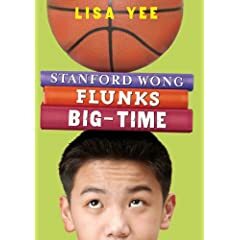 I needed to read Standford Wong Flunks Big Time by Lisa Yee to be caught up on all things Yee related, and I am glad I did. I am still amazed at how seamlessly Yee can integrate the three books of this series together. This book is no exception. As with So Totally Emily Ebers, we find ourselves introduced to a friend of Millicent Min from Millicent Min Girl Genius. This time the character is a boy, Standford Wong. Stanford is being tutored by Millicent to pass his English class. He is also after Emily trying to make a romantic connection. Yes, I am jealous, and yes, I have let her know this fact, but Franki at A Year of Reading has recently posted an interview with Peggy Gifford writer of Moxy Maxwell Does Not Love Stuart Little. This is a must check out blog interview. And after you check that out, you can check out where the author commented on my blog after I reviewed the book. Okay, not as cool as an interview, but very special none the less. When I purchased Smart Answers to Tough Questions by Elaine Garan, I also purchased The Reading Zone by Nancie Atwell. Again, my thoughts on teaching reading were confirmed ten-fold. It is really hard to explain Atwell's ideas without sounding to simplistic, but her "manifesto" shouts out--- JUST READ! No more of this craziness, trying to get kids to predict, connect, visualize, question, summarize, re-tell right in the middle of their reading time. Give them the time to read, give them the tools to picking the right books, give them the passion to chose, and everything will fall into place. I must admit, it was a little hard to read that student's did not need to use sticky notes while reading, basically because it stops the act of actually reading. But, on the other hand, it makes sense. Since Atwell teaches students a little older than mine, she talks about only responding to their books every 3 weeks and only when they finish a book. But she does mention that the fifth grade students at her school, CTL (Center for Teaching and Learning), still respond every other week. We have been responding every week and I have been trying to come up with a better system for 3 years, tweaking it a little each year, but I don't think I could tweak to every 3 weeks. So I am going to go for every other week. I also know my fifth graders need to respond in smaller chunks because if they waited until the end of the book, most would end up writing a book report. What Made You a Reader? If you want to play, copy the list and put a + in front of the books that hooked you as a reader. What are some of the books that hooked you that DIDN'T make it on the list? Lots of books hooked me at different parts of my life. I know One Fish Two Fish is the first book I could read alone. I can remember being on vacation somewhere where it rained everyday and we were in the mountains and I read Pipi Longstocking books till my eyes bleed. I used to stay up at night reading Shel Silverstein poem books and laughing like a loon. I remember distinctly the day my mom purchased Harry Potter and the Sorcerer's Stone (my first year teaching in '98) and told me my kids were going to be over the moon about it, which they were. But the book that launched my career as the best Read Aloud teacher in my school was The Watson's Go To Birmingham-1963 by Christopher Paul Curtis. I LOVE THIS BOOK with all my heart. I read it aloud every year. I have voices for everyone in the story and it never fails at making my kids readers---No matter what there were before they came to me. Since I liked Lizzie Bright and the Buckminster Boy by Gary Schmidt so much, I decided to read another book by Schmidt. I chose First Boy. I was not disappointed in this book either. One thing I did not see in this book as in Lizzie Bright and Buckminster Boy was the layering and the wonderful story elements of a historical fiction novel. (Although this is not a historical fiction novel.) I just really thought Lizzie Bright and the Buckminster Boy was one of the best books I have ever read, so it is hard to live up to. I can now recommend two of Schmidt's books to students. This book will definitely be for my boys. (Not that girls couldn't enjoy it) I love the fact that Schmidt does not revert to using cuss words just because his characters are teenage boys. In fact, I don't remember seeing any in the two books. Wow! Elaine Garan for President! Okay, maybe Secretary of Education or something. And I am not the only one who feels this way. Click here for an article from the Fresno State News dot com. When I saw this post by Franki on A Year of Reading, I purchased the book right away. It sounded like something right up my alley. I was not mistaken. It is the single most important professional book I have read in quite awhile. 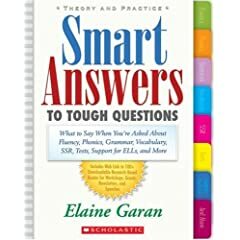 The book is titled Smart Answers to Tough Questions by Elaine Garan. The book contains smart, researched, complex, complete, and often hard-to-swallow answers to the questions most asked about the way we teach Literacy. The book is divided into questions about Reading, Phonics and Phonemic Awareness, Eye-Movement Research and Decodable Text, Fluency, Writing, English Language Learners, and Standards, Accountability, and High-Stakes Testing. Within the sections the format is as follows: "The Tough Question," "Your Bottom-Line Answer," "Something for You to Think and Talk About," and "The Proof." If you have ever had any questions about if what you are doing is the right thing... Just open this book and dig in! 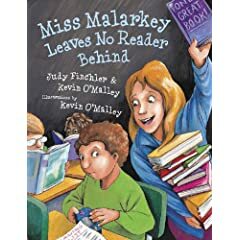 There are some issues in this book that are hard to swallow, and you may be taking part in activities which are not going to further your student's abilities in Literacy, but probably deep inside you always questioned it. This book can help you sort through those questions. I was particularly interested in Garan's information on Accelerated Reading and Dibels, both which my school participates in and I have always questioned. The only thing that disappointed me slightly is the fact that the cover shows what looks like tabs for the section, but are really just a cover picture. There are no tabs in the book. I want to pass this book along to you and hope that you do the same; pass it along to someone you think would appreciate it as well. This morning I was going through all the new posts from my blogging buddies, and I read this one from Franki at A Year of Reading. I immediately wanted to check out the suggestions for First Day of School Read Aloud. What I found was so much more. I am thrilled to find the Choice Literacy website. I have signed up to receive newsletters and I am excited to get reading. Franki Sibberson is one of the contributing authors along with many others including another one of my favs, Aimee Buckner. (She learned a lot of what she knows from the same people I did, and I love that!) Check it out, you won't be disappointed. Each time I would get on the Bookmobile that visits our school, I would see this book called Donuthead by Sue Stauffacher. If you have ever seen the cover of that book, you would know it was hard for me to pass up. It just looks F-U-N-N-Y. And it was. 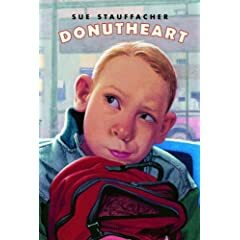 So now I see in the library there is a sequel, Donutheart by Sue Stauffacher. Basically you must read the first to understand the second, otherwise you will wonder "What the the heck is up with this kid?" Franklin Delano Donuthead, the main character, is a rare bird. I am sure I have met his type along the way, and enjoy trying to pinpoint his real life equal. He is, in his own words, "asymmetrical" because one side of his body is longer than the other. (Something he likes to measure nightly.) He is also very cautious, a germaphob if you will. Someone he contacts on a daily basis is Gloria Nealot, his favorite chief statistician at the Washington D.C. National Safety Department. In the first book, Franklin meets Sarah Kervick. Sarah becomes Franklin's body guard, of sorts and Franklin her tutor, of sorts. The second book finds Franklin and Sarah still friends, Franklin still measuring, Gloria still being called daily, and Sarah much worse off in her family life than before. Something new about this book is Franklin is in love. (A very strange place for Franklin) Also, Sarah has begun figure skating. Although I liked the first book better, I still really enjoyed reading about Franklin maturing into middle school. I didn't get that lump in my throat feeling I had at the end of Donuthead, but I would recommend the book. The book definitely ended in a way that lent itself to a third book. I will be waiting and watching. 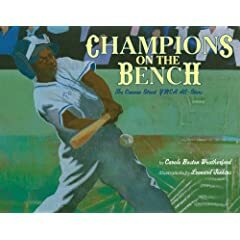 Champions on the Bench by Carole Boston Weatherford and illustrations by Leonard Jenkins is the perfect companion book to Campy The Story of Roy Campanella that I wrote about the other day. Champions on the Bench is a story based on the 1955 Cannon Street YMCA Little League All-Stars who faced discrimination when the white teams refused to play them in the Little League World Series. This story is a realistic way for students to learn about discrimination and segregation because it is a topic many can relate to, sports. I loved the pictures in this book which were created with pencil, acrylic, and spray paint (of all things). It is just an all around lovely book and I will be reading both this book and Campy this year.